About a couple of months ago, the little man came up to me asking for help. He needed a packing tape and a hand to hold the sign above while he tapes all around it. I offered to do the tape while he hold the paper which was okay with him as long as it was posted outside his door. 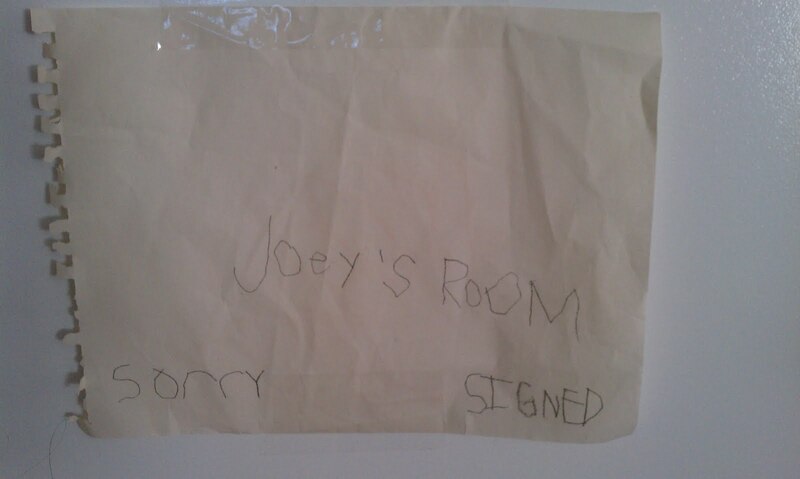 He will not tell me the need for a sign outside his bedroom door but I have a pretty good idea. See, the little girl and I have been barging in on him while he is inside his room and I don't think he likes that. Especially the fact that he has to pick up after his little sister's mess, in his own room. The times that I am in his bed before he goes to bed at night does not make him happy either. He tells me I have my own room, I need to go and sleep there, lol. The husband said to keep the sign on (I did not have plans to take it down anyway) because he wants to encourage his son to tell us what he feels or thinks. We want him to be open about his feelings or misgivings (if ever) so it can be addressed.